This disc includes compositions of great stylistic difference from various periods in Handel's life. In her liner-notes Jeannette Sorrell writes: "While he [Handel] might not have perfectly absorbed the languages of his different homelands, his ability to absorb their musical styles was stunning". That seems to be the subject of this disc and explains the selection of works. Surprisingly the earliest piece comes last. Handel composed his setting of Psalm 110 (Vulgate: 109), Dixit Dominus, in April 1707 in Rome. It is scored for five solo voices and five-part strings with basso continuo. There are two verses which are set in the form of arias, for soprano and alto respectively. The other verses are set for the whole ensemble; these also include passages for solo voices. The whole texture suggests that the solo parts are to be sung by the members of the choir. I am not sure whether Kiera Duffy and Meg Bragle are regular members of Apollo's Singers. They are listed as such in the booklet, but that could just mean that they participate in the tutti sections. There is some difference, though, in the way they sing their solos and the performances of the other members of the choir in their solo episodes. This is quite prominent, especially because Duffy and Bragle use quite a lot of vibrato, much more than the other soloists. Their incessant vibrato is damaging, even though it isn't that wide. Dixit Dominus is a theatrical work, and especially the opening verse and the sixth verse, 'Dominus a dextris tui', are highly dramatic. That doesn't really come off here. Dynamically the singing and playing are too flat, the tempi are on the slow side and too little attention is paid to the text. Dixit Dominus was composed for the nameday of the Spanish King Felipe V, which was celebrated on 1 May in Frascati near Rome. In that respect it wasn't very different from the Ode for the Birthday of Queen Anne, composed in 1713. The author of the text of the Ode was Ambrose Philips who praises the Queen's virtues as peacemaker. This is particularly expressed in the first chorus (with alto solo): "The day that gave great Anna birth, who fix'd a lasting peace on earth". This is used as a refrain and refers to the Peace of Utrecht of 1713 which marked the end of the War of the Spanish Succession. The opening movement is one of Handel's most beautiful creations: a duet of alto and trumpet, over chordal string playing, on the text "Eternal source of light divine! With double warmth thy beams display, and with distinguish'd glory shine to add a lustre to this day." It is again Ms Bragle's vibrato which impairs the effect, especially as she doesn't blend that well with the trumpet. The celebratory character isn't fully conveyed and the not very brilliant recording does not help either. The last section is set for double choir, and here the second choir, acting like an echo of the first, is placed behind the second. 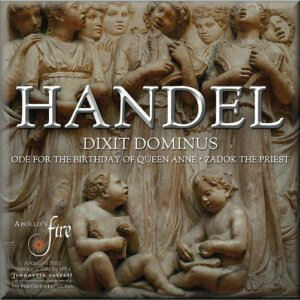 Zadok the Priest is one of Handel's most famous compositions. It is one of his four Coronation Anthems, which were performed on 11 October 1727 at Westminster Abbey on the occasion of the coronation of George II. It is still often performed at celebrations connected with the British monarchy. It is the shortest piece of the four, comprising an instrumental sinfonia and a chorus in two sections: 'Zadok the Priest' and 'God save the King!'. One of the features of the sinfonia is the increase in drama, reflected by a dynamic acceleration. That comes off only partially here. That said this piece is the most convincing on the disc. The jubilation which is reflected in the text is realised rather well. The Ode is introduced by a solo for the timpani whose composer is referred to as "J.D. Philidor" in the track-list. In the liner-notes Ms Sorrell mentions "André Philidor" as the composer. That is François-André Danican Philidor, who spent some time in England and was also famous as a chess-player. It is much more likely that the composer was in fact Jean-Danican (1657-1708) as he was active as a wind player in the army, but also as a drummer. He was never in England, and the inclusion of this piece in the programme is rather odd. It may work well in a live performance, but a disc is different. Also I cannot see the justification for including the plainchant psalm tone of Psalm 110; it does not help that it is performed so artificially. As a bonus we hear the double chorus which closes Israel in Egypt, 'The Lord shall reign forever and ever'. This is often performed as an encore in concerts of this ensemble. It is nicely sung, but its full power doesn't come across. On balance this recording has left me not very impressed. The dramatic character of Handel's music is not fully conveyed, and the interpretations fail to satisfy in terms of style. The alternative for the Ode is Robert King (Hyperion, 1989), for Dixit Dominus Thomas Hengelbrock (review).